1750-1754 1750 (22 June) Jonathan Edwards is dismissed from his Northampton (Mass.) church when he rejects the liberal "halfway covenant." He becomes pastor of a church in the frontier settlement of Stockbridge, in western Massachusetts. 1754-63 French and Indian War (See history). 1754 Colonies adopt Benjamin Franklin's "Plan of the Union" of English colonies. 1751. 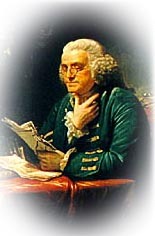 Benjamin Franklin publishes New Experiments and Observations on Electricity. 1755-1759 1758 General Montcalm and his French troops are defeated at Fort Ticonderoga, New York. 1758 Jonathan Edwards becomes president of the College of New Jersey, later Princeton University. 1759 Quebec surrenders to the British under Wolfe. 1758 Benjamin Franklin, "The Way to Wealth"
1760-1764 1760 Pennsylvania-born painter Benjamin West travels to Italy to study art and becomes a celebrated artist in London. Benjamin West's Self Portrait (1770) courtesy of Carol L. Gerten (Jackson)'s site at the University of North Carolina. 1763 10 February. 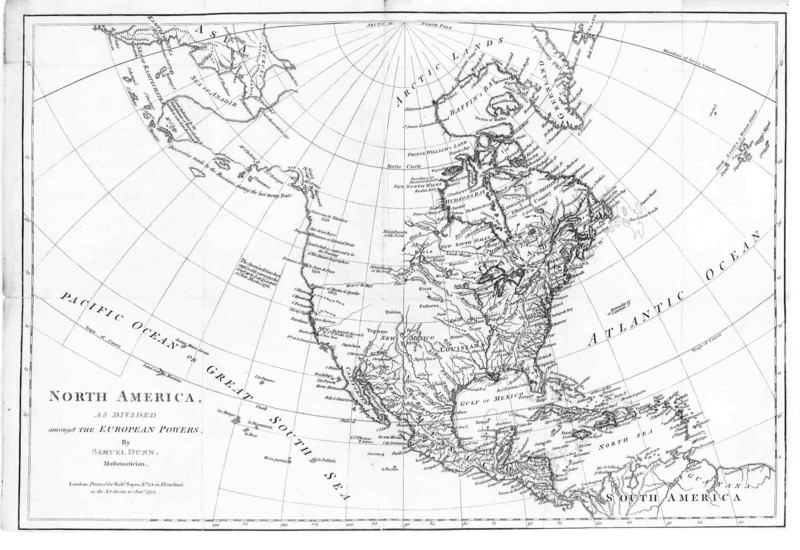 Treaty of Paris ends the Seven Years War (French and Indian War). France cedes Acadia (Nova Scotia), the St. Lawrence River islands, and Canada to the British. May-November. When the British refuse to supply less expensive trade goods and ammunition, the Ottawas under Chief Pontiac destroy western British garrisons, among them Fort Duquesne. After beseiging the garrison at Detroit for five months, Pontiac withdraws. Patrick Henry presents the theory of a mutual compact between the governed and the ruler. 1765-1769 1765 Stamp Act is enacted by English Parliament and meets with colonial opposition. 1766-67 Daniel Boone travels to the Kentucky territory through the Cumberland Gap. 1769. Fr. Junipero Serra founds the Mission at San Diego and eight others, hastening the colonization of California. (Another biographical sketch.) 1765-6 William Bartram travels in Florida with his father, John Bartram. 1768 Milcah Martha Moore, "The Female Patriots. Address'd to the Daughters of Liberty in America, 1768"
1773 May 10. Due to pressure from the East India Company, which has suffered because of the colonists' successful embargo on tea, the Tea Act becomes effective. It retains the threepenny tax on tea but repeals the previous export tax, so that British tea merchants can now undercut the prices of American sellers. 29-30 November. After colonists decide to send the Dartmouth with her cargo of tea back to England, Massachusetts Governor Thomas Hutchinson declares that the ship must stay in Boston Harbor until the tea taxes are paid. December 16. Boston Tea Party. Samuel Adams addresses a crowd of 8,000 colonists gathered in the Old South Church, telling them of Governor Hutchinson's decision. That night, colonists disguised as Mohawk Indians dump 342 casks of tea into Boston Harbor. 1774. All colonies except Georgia send representatives to the First Continental Congress. 1775 March 23. In a speech to the Virginia legislature, Patrick Henry encourages Virginians to arm themselves, saying "give me liberty or give me death." April 18-19. Paul Revere's midnight ride. 19 April: Battles of Lexington and Concord, Massachusetts, first battles of the Revolutionary War. 10 May. Second Continental Congress convenes in Philadelphia, with John Hancock as its president. 17 June. British victory at Battle of Bunker Hill. July 4. Second Continental Congress adopts the Declaration of Independence. 27 August. The colonial army suffers a serious defeat at the Battle of Long Island. 16 September. Having already decided to remove the army from New York City, Washington repels the British forces of General Howe in the Battle of Harlem Heights. 21 September. Fire spreads over New York, destroying from 300-1,000 buildings. Early in the morning of this day, Nathan Hale is captured by the British and executed as a spy the next day, September 22. According to an 1848 memoir by a friend, his last word were these: "I only regret that I have but one life to lose for my country." 9 October. Mission of San Francisco de Asis is founded; it later becomes the city of San Francisco. 12 May. After 40 days of siege, General Benjamin Lincoln surrenders Charles Town (Charleston), South Carolina, to the British forces commanded by General Henry Lincoln. 2 October. After being captured with Benedict Arnold's plans for the surrender of West Point, the headquarters of the Continental army, British spy Major John Andre is hanged. Having escaped on 25 September after hearing of Andre's capture, Arnold later becomes a brigadier general in the British army. 17 January. At the battle of Cowpens, South Carolina, General Daniel Morgan defeats the British forces of Colonel Banastre Tarleton, an important victory for the Americans. 10 June. Reinforced by troops under General Anthony Wayne, American forces under the Marquis de Lafayette help to fend off raids by Benedict Arnold and Cornwallis in Virginia. 6 September. Benedict Arnold and his troops attack and destroy parts of New London, Connecticut. 28 September. After French Admiral de Grasse defeats the British fleet under Admiral Thomas Graves and gains control of Chesapeake Bay, the siege of Yorktown begins as 9,000 American and 7,000 French troops under General George Washington and Jean Baptiste Donatien de Vimeur, comte de Rochambeau, converge on the city. General Cornwallis signs the surrender papers on October 19, thus ending the last major battle of the Revolutionary War. 1783-5 Noah Webster's "Blue-Backed Speller" (A Grammatical Institute of the English Language) helps to standardize spelling and to distinguish British from American English. 1785-1789 1785. March. Thomas Jefferson is appointed minister to France, replacing Benjamin Franklin. 28 November. In the Treaty of Hopewell, the Cherokees' right to land in the Tennessee area is reinstated, nullifying an earlier treaty. 1786 Congress adopts a decimal coinage system based on the Spanish milled dollar. 1787 Shays's Rebellion in western Massachusetts. Farmers facing foreclosure deny judges entrance to the courthouses where bankruptcy proceedings are heard. In a confrontation at Springfield, four farmers are killed as 1,000 militiamen fend off approximately 1,500 farmers. 1787. 25 May. The Federal Convention convenes in Philadelphia, although only seven states are represented. Several provisions of James Madison's Virginia Plan become part of the U. S. Constitution, including a bicameral legislature, a federal judiciary branch, and an executive branch. The Constitution is approved on 17 September and then is sent to the states for ratification. October 1787-May 1788. The Federalist Papers appear in New York newspapers under the pseudonym Publius. The letters are written by James Madison (1731-1836), Alexander Hamilton (1757-1804), and John Jay (1745-1829). 1790-1794 1790 First American cotton mill. 1791 Washington, D. C. established as U. S. capital. First Bank of the United States is founded under Alexander Hamilton and is granted a 20-year charter. Its charter is not renewed in 1811. 1794 Whiskey Rebellion breaks out in western Pennsylvania among farmers who oppose the collection of the tax on liquor and stills. 1794 Jay's Treaty provides for withdrawal of British forces from the Northwest Territory by 1 June 1796 in exchange for payments of war debts to British citizens. It is ratified on 24 June 1795. 1790 Judith Sargent Murray, "On the Equality of the Sexes"
1793 The Hapless Orphan; or, Innocent Victim of Revenge by "an American Lady"
1795-1799 1795. 3 August. In the Treaty of Greenville, twelve Ohio tribes turn over lands to General Anthony Wayne after their defeat in the Battle of Fallen Timbers in 1794. 1796. 1 June. Tennessee is admitted to the Union as a slave-holding state. 17 September. Washington publishes his Farewell Address; it states his reasons for returning to private life and deciding not to run for a third term as president. 7 December. John Adams (Federalist party) wins the presidency and Thomas Jefferson (Democrat-Republican) becomes vice president in the nation's third presidential election. 1797. A cast-iron plow is invented, but farmers fear it will poison the soil and refuse to use it. 18 October. Amid tensions between the US and France, French foreign minister Tallyrand's agents suggest a "loan," essentially a bribe, to bring the French to the bargaining table. Charles C. Pinckney, the American minister to France, refuses, saying, "Millions for defense, but not one cent for tribute." 1798. The passing of several Alien and Sedition Acts draws fire when Benjamin Franklin Bache, the grandson of Benjamin Franklin, is arrested for libeling President Adams. Thomas Jefferson later pardons all those convicted under the Sedition Act, many of whom were Democrat-Republicans. Timelines For a more comprehensive chronology of historical events in this period, visit these sites. 1776-1789 Timeline at the Library of Congress.